Today is the LAST DAY to enter my blogoversary book giveaway. Go to last Monday's post and leave me a comment. I'll be drawing a name first thing Tuesday to win Women of Passions: Ordinary Women Serving and Extraordinary God. Welcome to Monday Manna. The purpose of this meme is to get together and get to know Christ more through His Word. 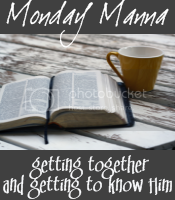 On the first and third Monday of each month, anyone who wishes can post their thoughts on a verse I introduced at my blog the Thursday before. It doesn't have to be a long post -- just a few thoughts, a picture you feel helps express it, a poem, a short story, a devotional. I tried to choose a freedom-related verse because of Independence Day (and I hear Canada and Venezuela celebrated the same on different days last week!). I hope it made 4th of July even more meaningful for you. I know it put ME in a bit of a different mindset. Looking forward to reading your contributions. My thoughts are below. It seems like a contradiction when you first look at it. The first part of this verse, and the last part. When we accept Christ as our Savior we are saved. But from what? And even if we are free from sin, it doesn't mean we don't keep committing it. In fact, we often do exactly what the middle part of this verse says. We use [our] freedom as a cover-up for evil. Thanks for reading! Be sure to link up below with your own thoughts, and read what others have to say. I'm sure you will be blessed. Is this any way to show our appreciation? It's soooooo easy to stop reading after the first part of the verse. Thanks, Joanne, for the timely reminder. Interesting thoughts. Thanks for hosting this Jo. Well put, Joanne! This is a great way to begin my week. Thank you. It's taken me a long time to come to some understanding about my freedom in Christ. You're right; it seems a contradiction at first glance. But truly, the greatest freedom I have known has come from being bound to the truth of Jesus Christ. We could spend a lifetime trying to make some sense out of "grace." But at the end of the day, the numbers just don't add up. We get the "whole lot" with Jesus ... at no cost to us. He is so worthy of our very best.